In our first look at a regular poetry reading/performance Rochford Street Review has focused on the Sydney based Blue Space Poetry Jam. We would love to cover readings and performances across Australia (and indeed internationally as well). If you are interested please get in touch! Blue Space Poetry Jam – A brief history…. The Blue Space! Poetry Jam (http://www.thebluespacepoetry jam.com.au/) was conceived over a stroll down New Canterbury Rd Dulwich Hill late 2011. On this walk, a rare looking building with an orange facade and blue circular window frames presented itself to me again as a too quiet large chunk of real estate. Rumours existed thick between real estate agents who became almost camera shy when I asked about that fallow secretive building. In November of that year a meeting was brokered by a poetry fan between myself and Miles Merrill at Petersham Bowling Club. It was a funny meeting – I, in homeless vagabondage and the others, blew a jazz cigarette and Miles was overcome by a temporary but concerning dizziness. He asked for water and I ran to the nearest tap and filled my leather coin purse and gave him water. After that kafuffle, the three of us wandered backed to our transports and the Blue Space Poetry Jam was born. The venue for 2012 was the Petersham Bowling Club. They were very gracious and helpful – and the beer and bistro was great. A hi to the management and staff John, Peter, Lizzie and Craig. In 2012 we’d hosted some great artists and figures – Candy Royalle, Randall Stephens, Tug Dumbly, Benito Di Fonzo, John August, Bernadette Smith, Lou Steer, Angela Stretch, Catherina Behan and a few more. We even had actor William Zappa give an impromptu performance, fine poet Owen Kirkby recite verses, travel writer Paul Giles evoke Baudelaire, Jack Peck from Word in Hand sing – and Bowness Fellow in Photography (and erstwhile poet) Alex Wisser relating some minority philosophies that weighed on his mind that day – all on the open mic. 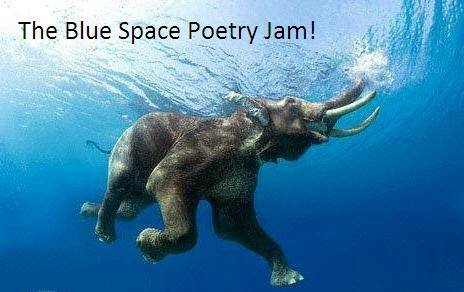 The distinctiveness of The Blue Space Poetry Jam is that it includes live music performance as accompaniment or dialogue with the poetry. Musicians like Fergus Furlong (drums) from Harold Park Jazz, Brianne Curran (violin) from Takadimi, Kyle Taylor (bass), Matt Crane (guitar), Renee Falez (guitar/cajon) and Eden Ottignon (bass) were somewhat regulars and some later went on to perform at other gigs with poets they meet in The Blue Space Poetry Jam community. ZED or Zvonko Jovicic kept on and we’re really thankful for that continuity. We even had Sydney visual artist and Glebe Drawing Group mentor Geoffrey Goodes make his inimitable and charming sketches at one or two of our events. 2013 then burst onto the scene with an incredible opening event featuring head of the Australian Poetry Slam Miles Merrill and an international visitor –the widely published and translated Iranian poet exiled in London, the polymath Ali Abdolrezaei. It seemed to be a hard act to follow and after three more events we petered out. For that year I applied myself to writing and made solid achievements in publishing from neomodernist journal Former People to Pete Spence’s wonderfully loveable ETZ and upcoming appearances in Southerly, 21D and Arena Magazine –who are celebrating 50 years! I read online a musician who wrote “good artists invest in themselves” –such a simple and elegant maxim. I’ve kept to it and I don’t rest on my laurels too often. The Blue Space Poetry Jam finally returned in 2014 thanks to Marrickville Council, the blue window frames of the conspicuously quiet orange building in Dulwich Hill, the blue card I carry for concession signifying to some office worker that this guy too sometimes gets the blues but that art, music and writing are like three crowns of a sailor. It seems as though an ecosystem of spoken word has evolved in Sydney. This ecosystem is real and raw, it lives and breathes in events and people, poetry and stories, scattered around the city. I suppose this ecosystem could have just as easily sustained itself online. Yet I suspect it is precisely because so much of our lives now are already compressed into digital form that spaces like Blue Space Poetry Jam are sought after by those who love the tangibility of words. The physical location of Blue Space seems just as important as the idea behind it– or rather, the location is the idea. So let me describe it: A bright room at dusk. Sound ricocheting off floorboards and clean walls. Planes overhead. Poets armed and ready. Blue Space turned out to be my favourite kind of performance space: free from theme, it’s a safe place to be risky. The range of poetry presented demonstrated that: Ariel Riveros Pavez warmed up the audience with his contemplative and sensual poems; Mark Roberts followed with poetry at once warm and wise. As one of the featured poets, I was grateful for the space— of all varieties— to test out poems that had previously only lived on the page. And finally, the passion of Luke Beattie aka Ellie Beats and rhythms of Jordana Arndt cut through the night (and the peak hour rush before Sydney’s night time aircraft curfew). We were regaled by the lyrical sea shanties of singer-songwriter Zed to see us on to the break on the balmy balcony overlooking parklands. The open mic then took flight – starting off with Rae Desmond Jones and including poet, satirist and playwright Benito Di Fonzo; and even a finalist from the Brisbane heat of the Australian Poetry Slam, who improvised a staged vignette. Miles Merrill, head of the Australian Poetry Slam was to be seen in the audience enjoying himself. It reminded me, once again, why this kind of revolution shouldn’t solely be digitalised. 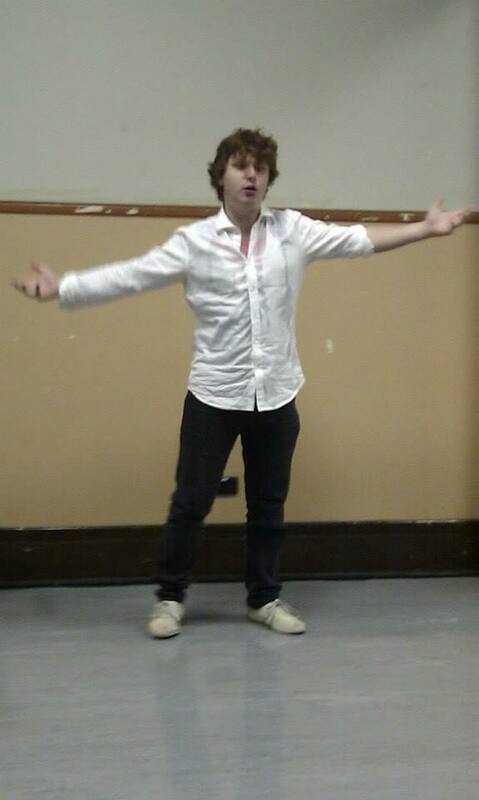 Benito Di Fonzo’s Quick Recollection On The Blue Space Poetry Jams‘ Inaugural St Peters Town Hall Appearance. And then, as the school shirt and tie began to come off, you saw what looked like blood on the juvenile’s chest. He continued to announce his impending suicide and Life’s part in its occurrence through a free-verse mildly tainted by 4/4 common time too much hip-hop. Apparently the blood was only lipstick, most likely from the young gothette watching him eagerly as he awkwardly pressed page-down on his MacBook. Then there was the fellow who channelled Kurt Schwitters’ style phonetic Dada and scatted the magic through the banal instructions from the back of a Health Care card. It made you happy and you weren’t sure why, that’s what art should do. Another highlight was the musical storytelling of an urban pirate in dark glasses and Spanish guitar. It was like watching Tom Waits do ice at Jack Kerouac’s wake on a Manly ferry. By the time I performed a couple of new pieces, namely a Valentine’s number for Molly and a little riff on the darker implications of positive affirmations, our suicidal school boy was gone. Hopefully not to his death, but more likely to watch episodes of Crown of Dwarves or whatever it’s called on his MacBook from under the pretty gothette’s bed-sheets. More power to them. I shall watch the Blue Space and its avant gardening of Marrickville’s kitsch municipal venues closely. This entry was posted in Ariel Riveros Pavez, Belinda Lopez, Benito Di Fonzo, Blue Space Poetry Jam, Issue 11 and tagged Alex Wisser, Ali Abdolrezaei, Angela Stretch, Ariel Riveros Pavez, Australian Literature, Australian poetry, Baudelaire, Belinda Lopez, Benito Di Fonzo, Bernadette Smith, Blue Space Poetry Jam, Brianne Curran, Candy Royalle, Catherina Behan, Eden Ottignon, Ellie Beats, Fergus Furlong, Geoffrey Goodes, Jack Peck, Joanna Arndt, John August, Kurt Schwitters, Kyle Taylor, Lou Steer, Luke Beattie, Mark Roberts, Matt Crane, Miles Merrill, Owen Kirkby, Paul Giles, Performance Poetry, Pete Spence, Petersham Bowling Club, Poetry Reading, Rae Desmond Jones, Randall Stephens, Renee Falez, Tug Dumbly, William Zappa, Zvonko Jovicic by Mark Roberts. Bookmark the permalink. Her name is Jordana Arndt, not Joanna. 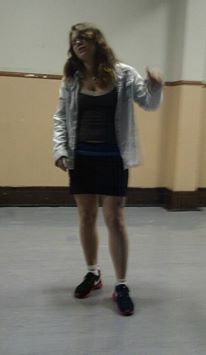 She is an Australian emcee who goes by the alias ‘Iunno’. Thanks for the correction – text has been updated.